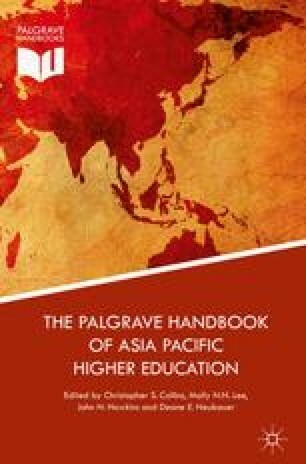 This chapter will focus on the development of Asian quality assurance (QA) system in the massification era of higher education and while first analyzing the characteristics of QA agencies in major Asian countries. The major challenges faced by most QA agencies, including internationalization, autonomy, and accountability will be discussed as well. Two quality initiatives, mutual recognition of QA agencies’ decisions and Asia Pacific Quality Register (APQR) by Asian Pacific Quality Network (APQN) will be presented at the end of the chapter. Asia-Pacific Quality Network (APQN). 2010. Chiba principles. Asia-Pacific Quality Network. http://www.apqn.org/. Accessed 1 Oct 2010. ———. 2012a. Official website. Asia-Pacific Quality Network. http://www.apqn.org/. Accessed 1 Oct 2012. Calderon, A. 2012. Massification continues to transform higher education. University World News 2(237). http://www.universityworldnews.com/article.php?story=20120831155341147. Accessed 7 Jun 2014. Costes, N. et al. 2012. First external evaluations of quality assurance agencies—Lessons learned. European Association for Quality Assurance in Higher Education. http://eric.ed.gov/?id=ED512349. Accessed 15 Dec 2010.
International Network for Quality Assurance Agencies in Higher Education (INQAAHE). 2009. Guidelines of good practice in quality assurance. International Network for Quality Assurance Agencies in Higher Education. http://www.inqaahe.org/main/professional-development/guidelines-of-good-practice-51. Accessed 1 Dec 2009. ———. 2013a. Quality glossary. International Network for Quality Assurance Agencies in Higher Education. http://www.apqn.org/. ———. 2013b. GGP aligned agencies. International Network for Quality assurance Agencies in Higher Education. http://www.apqn.org/. Accessed 26 Jan 2013. Knight, J. 2005. The international race for accreditation. International Higher Education 40. https://www.bc.edu/content/dam/files/research_sites/cihe/pdf/IHEpdfs/ihe40.pdf. Vroeijenstijn, T. 2008. Internal and external quality assurance—Why are they two sides of the same coin?. http://www.eahep.org/web/images/Bangkok/28_panel_ton.pdf. Accessed 31 Mar 2012. Woodhouse, D. 2006. The role of quality assurance agencies in higher education in the 21st century. http://www.apqn.org/events/past/details/presentations/?id=103. Accessed 24 Aug 2016. ———. 2010. Internationalization of quality assurance: The role played by the networks. http://www.auqa.edu.au/files/presentations/internationalisation_of_qa___the_role_played_by_the_networks.pdf. Accessed 15 Feb 2011.